Ridge gourds are strange vegetable for some. 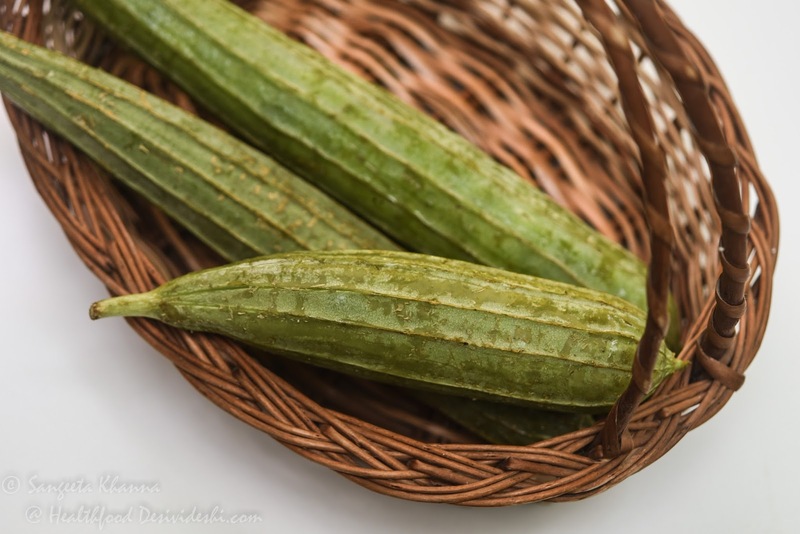 Having a tough skin with hard ridges doesn't get you a good reputation but if you have eaten this summer gourd from Indian subcontinent you would love the subtle taste it has. I had planted a few sapling this year but couldn't grow them well for some reason. All fresh produce taste the best when they are harvested fresh. If the produce is grown organically it adds to the nutrient profile as well as the flavour. Simple ingredients can make wonderful meals if the produce is good and the cooking is skillful. The skill in the cooking process is not to be confused by the intricacy and the complexity of a recipe but the knack of combining flavours, knowing how long an ingredients takes to cook so the flavour is not killed in the process. Those who love good food and great flavours, are generally great cooks themselves as they really understand the end product of the cooking process. Cooking is a life skill indeed. Simpler recipes are life savers. 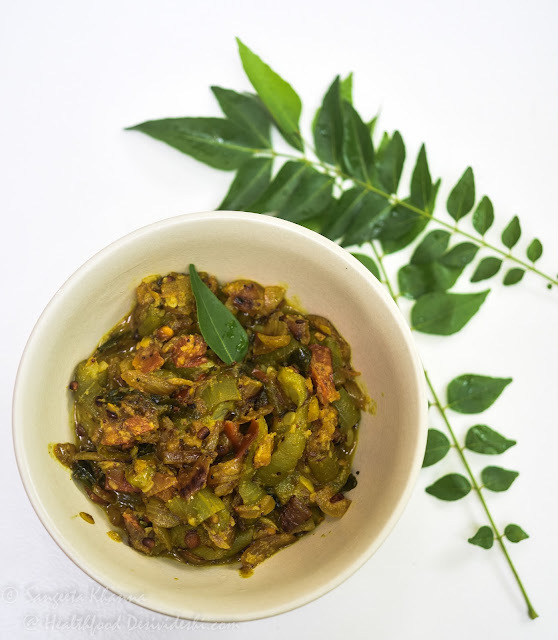 This ridge gourd curry I learnt at the Kairali (a healing resort) and found it so flavourful and simple that I decided to share it with all of you. Cooked in coconut oil, this curry was so light and flavourful one can eat it as is. 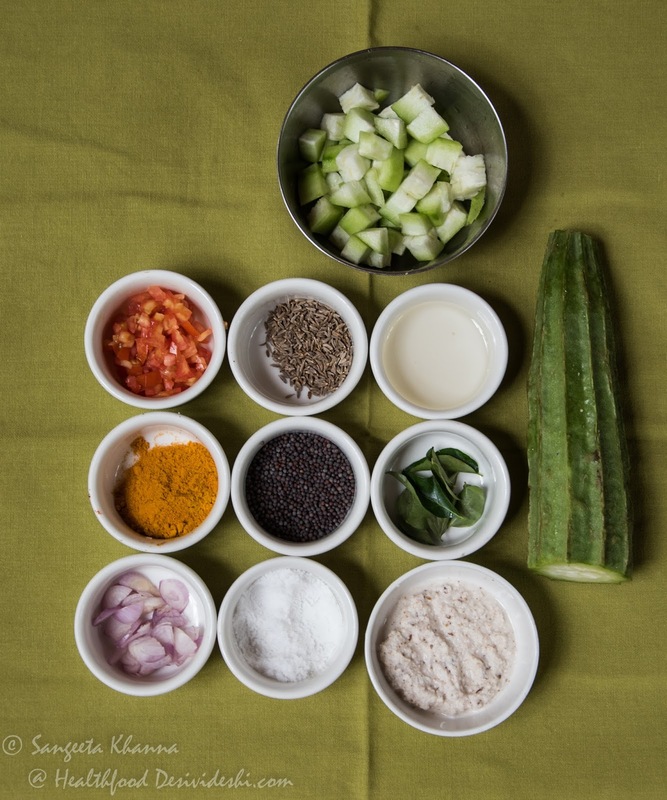 Here are the few ingredients needed for cooking this curry. Heat the oil in a pan and add the tempering ingredients in that order, one after the other, stirring gently. Cook till everything is aromatic and the onions are translucent. Add the ridge gourds and tomatoes, mix everything and cook covered for 5 minutes. Note that it is not to be cooked till completely mushy. Add the coconut, mix and it is ready to serve. Serve it with roti and dal or rice and sambar or dal or whatever way you like. This ridge gourd curry is rich in flavour and has a prominent coconut taste which feels refreshing. I made it a few times and found it great even when cooked like a stew with added water. This is one of those traditional recipes that confirm to the principles of Ayurveda. This ridge gourd chutney is almost a similar combination of flavours and we love it too. We like cooking ridge gourd with mutton mince as well and love it with rotis and kulchas.